Ah, America. Land of the free, home of the drunk. As soon as colonists set foot on American soil, they started building taverns and pubs. Like, immediately. They’ve been an important piece of American history ever since: In the early colonial days, they were meeting places, restaurants, social clubs, post offices, and much more. You could even say that the idea for independence was born in American taverns. Patriots during the Stamp Act days would meet to enjoy a flagon of ale and talk treason—and some bars even hosted Founding Fathers. 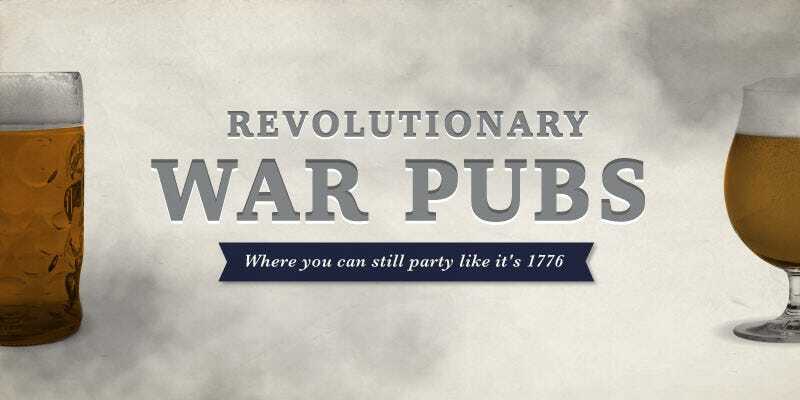 This Independence Day, party like Sam Adams (I don’t want to jump to conclusions here, but the man does have a beer named after him) or maybe Ben Franklin (seriously, half the dude’s “Quotes” page on Good Reads is dedicated to talking about how awesome booze is) and toast to freedom at one of these Revolution-era pubs! 1. The White Horse Tavern: This drinkery has been serving fresh seafood and cold beverages to Americans since 1673. In the early 18th century, it served as the meeting place of the Colony’s General Assembly, Criminal Court, and City Court (ah, the good old days, when laws could be made and criminals could be convicted in a bar.) The proprietor in 1776 actually left the place temporarily during the war so he and his family wouldn’t have to live with the Hessian mercenaries quartered there. But just because the tavern’s 350 years old doesn’t mean it hasn’t kept up with the times—it supports Rhode Island’s growing foodie scene by using fresh, local, artisan ingredients whenever possible! 2. The Griswold Inn: They’ve been putting up and feeding sailors and overland travelers since 1776. If you want to dine like it’s 1776, then check out the historic dining menu, which features classic dishes that would have been served back in the day. Or, just sit down for a drink at the tap room—it used to be a schoolhouse, but it’s been put to much better use (as a bar.) They’ve also got a general store, and you can still book a room at the Inn— but don’t worry, they aren’t currently billeting any filthy redcoats. 3. The ‘76 House: When you see the old-school American flag hanging outside this tavern, there’s no doubt that you’ve reached the right place. This pub, which was once known as Mabie’s Inn, played a major role in the Revolution. Not only did George Washington dine here, but it was also used as a makeshift jail for captured British spy Major John Andre, who conspired with famed turncoat Benedict Arnold, before he was hanged. That’s what you get for messing with G-Wash! 4. Fraunces Tavern: Fraunces operated as tavern from 1762 until the early 20th century (except for a brief period post-Revolution when it housed offices for the Departments of Foreign Affairs, War, and Treasury). It was a meeting place for New York’s Sons of Liberty, and it was the site of Washington’s 1783 farewell address to his officers after the war was won. Today, it’s a museum dedicated to American Revolution history in New York— but if you’re in search of booze (which you should be, because you’re in America) head next door to The Porterhouse at Fraunces and choose a drink from one of the largest selections of craft beer in the city. God bless the U.S.A.
5. The City Tavern: This Philadelphia establishment was founded in 1773—just in time for the Continental Congress (and a buttload of Founding Fathers) to roll into town. The Congress unofficially met here in 1774, and in 1777 the delegates celebrated the first anniversary of the Declaration of Independence here. The Tavern endured some early American scandal as well. Even though it played host to the Continental Congress, the owner actually ended up being a British sympathizer and left town when the British shipped out. WTF, right? To see the other pubs where you can get your Ye Olde drink on and toast to the good ol’ U.S. of A., check out our trip guide and handy dandy map!